Final hours of a Dravidian King. 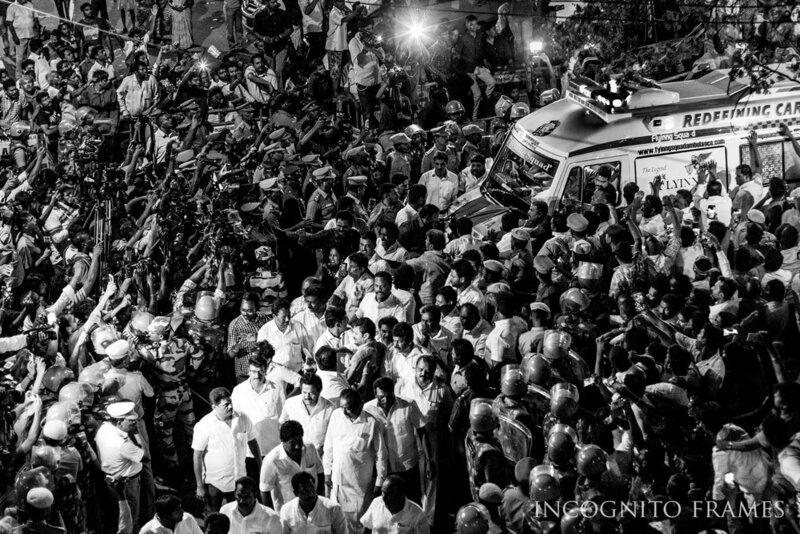 "The final hours of the Dravidian King" is a photo essay on the former chief minister Kalainger Dr.M.Karunanidhi’s last journey from Kauvery Hospital towards his home and his funeral procession through the streets of Mount Road. it's about how people reacts when they heard the news that he is "no more" and this is a of photographs from his hospital to the place where he is rested Marina beach. 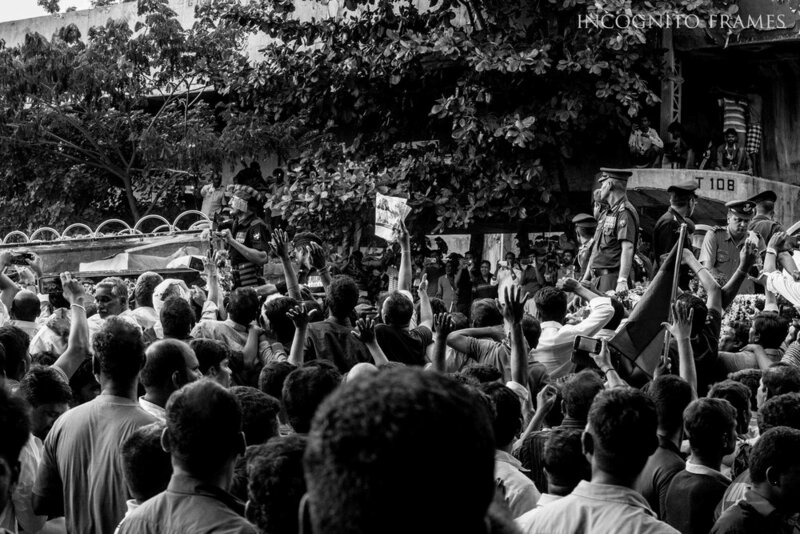 A Photo essay by Sujith. Dated: Aug 7th 2018, Madras. 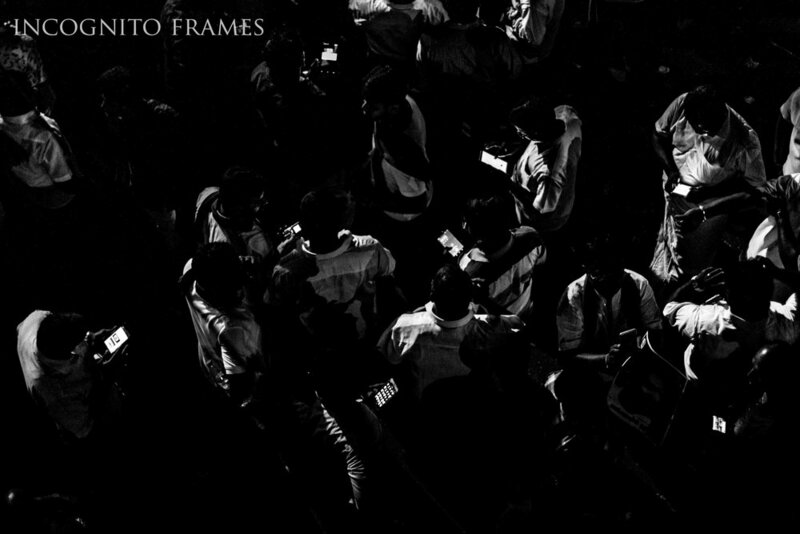 My initial intention was to take a few shots of people anxiously waiting outside the hospital and to come back, it was more to shoot the eco-system that was rapidly happening outside the hospital than what I ended up shooting - because this was my first time I had covered anything of this magnitude/kind. My previous experience of covering events or shooting people was mostly during weddings, I was more skeptical, shy, scared and a bit cringe. Only a handful of rulers in the world have ever ruled a province for more than 50 years even during monarchy and to repeat such a feat in democratic country is a herculean task. This is one from a long list of achievements among many criticisms that was thrown at him during his highly highly illustrious carrier. 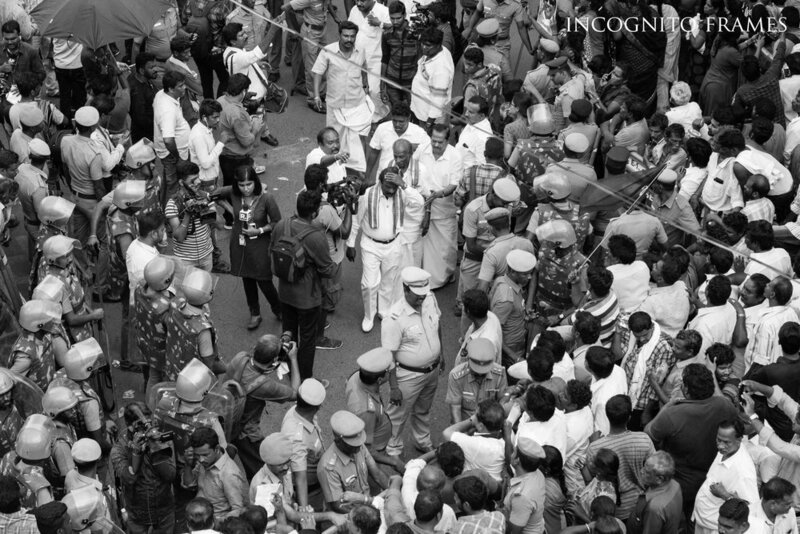 Love him or hate him, Tamil Nadu politics revolved around him since early 70's. 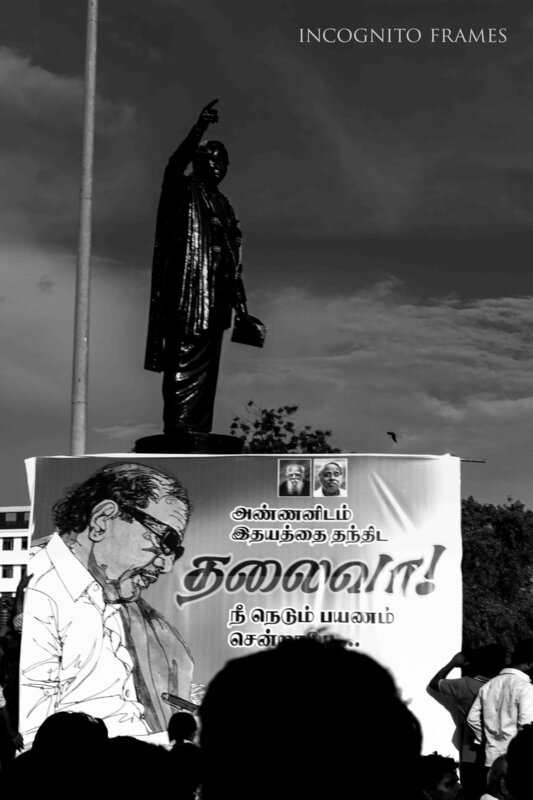 Kalainger Karunanidhi's contribution to the state, especially to the city of Madras was invaluable. The culturally rich state will surely his presence. 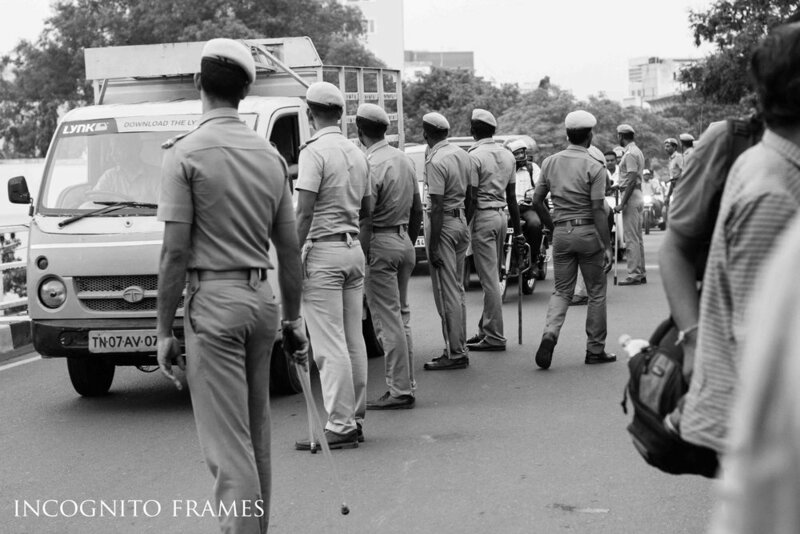 The Tamil Nadu police did a fantastic job during the entire course of his stay in the hospital. A shot from the top of the bridge, where bikes and even cars where stopping by to get a glimpse of what was happening in the hospital. 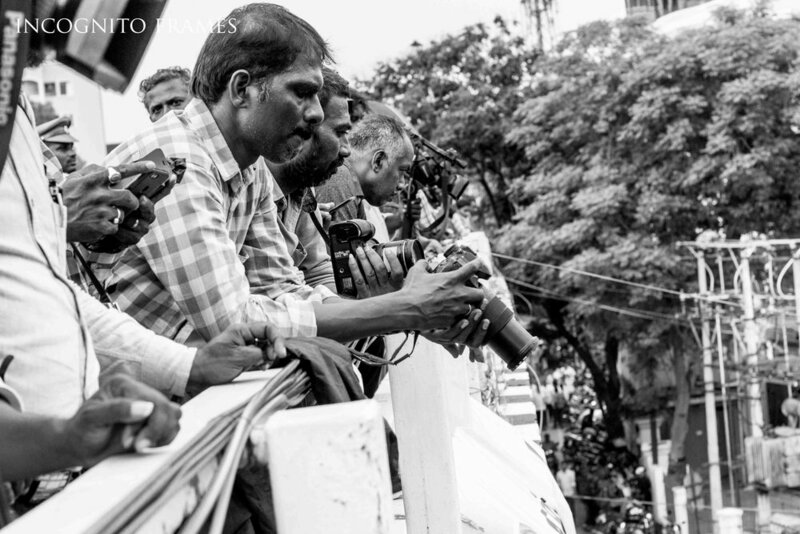 With press stationed on top of the bridge, the cops did the thankless job by managing the crowd. That is literally asking each and everyone to "please keep moving"
Among the celebrities, industrialists and other A list people visiting the hospital was actor turned politician Khushboo who was a former party member, she was visited the hospital more than once. One of the few instance where the crowd lost the temper. 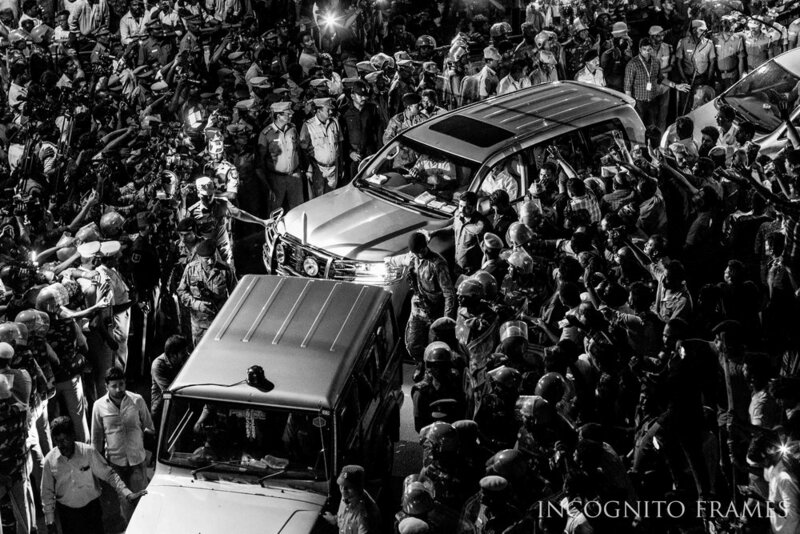 Here party cadres getting angry at a convey car of a leader from another party. 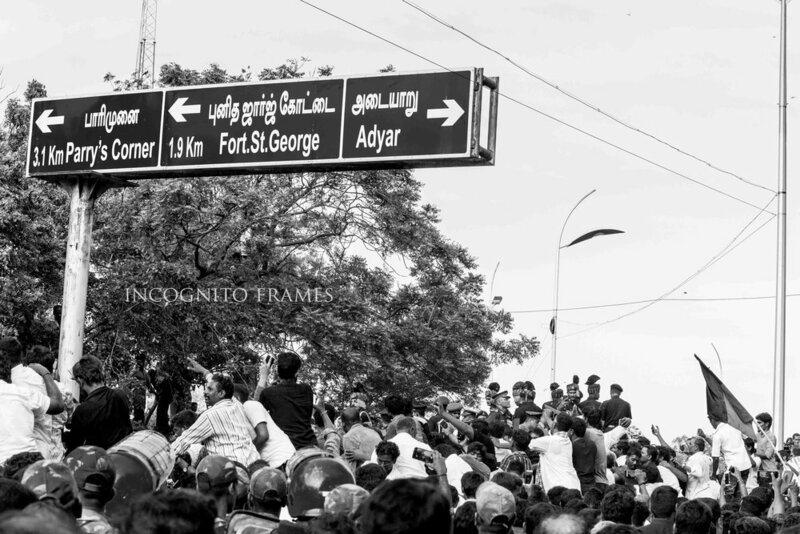 A huge banner of Kalaignar was just rolled out from the bridge facing the hospital giving a moral boost the thousands of cadres who were waiting outside. This was the moment when the news broke out, everyone here seen scrolling the news. Ironic. 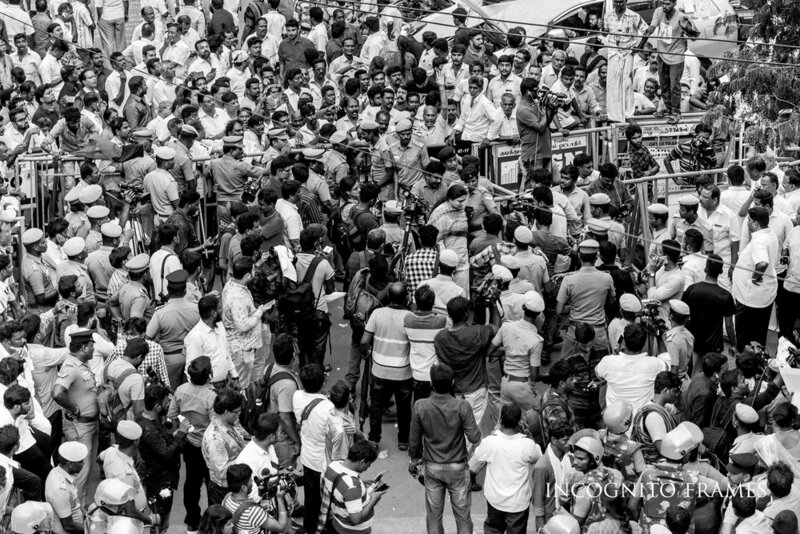 The huge crowd waiting outside the hospital gate had to scroll through their mobile phones to know what was happening in front of them. Senior DMK party leaders, headed my Mr.Duraimurugan, addressing the press and informing them that their request to bury their leader in Marina is still kept on hold. 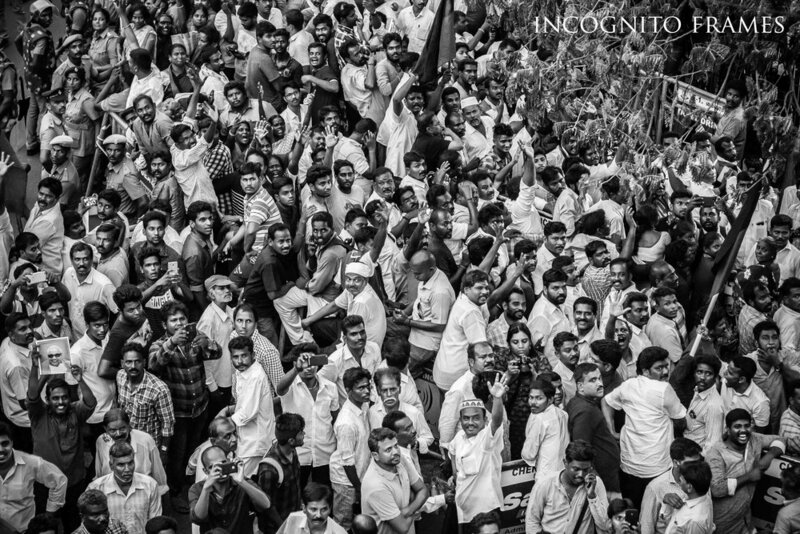 A small section of the crowd going bizerk after a team of party officials announced that the ruling government is yet to allocate their desired spot - next to his mentor Annadurai at the Marina Beach. An illustrious carrier comes to end here, Millions of people mourned his death from the bottom of their heart. A writer, who influenced the governance of Tamil Nadu more than anyone else. However the next generation rates him, Karunanidhi's contribution to the state, especially to the city of Madras is invaluable. The culturally rich state will surely miss him. An illustrious carrier comes to end here, Millions of people mourned his death. A writer, who influenced the governance of Tamil Nadu more than anyone else. However the next generation may rate him, Karunanidhi's contribution to the state, especially to the city of Madras is invaluable. The culturally rich state will surely miss him.